Emory’s Office of Student Conduct is conducting an investigation after many students found mock eviction notices posted to their doors on Tuesday morning. 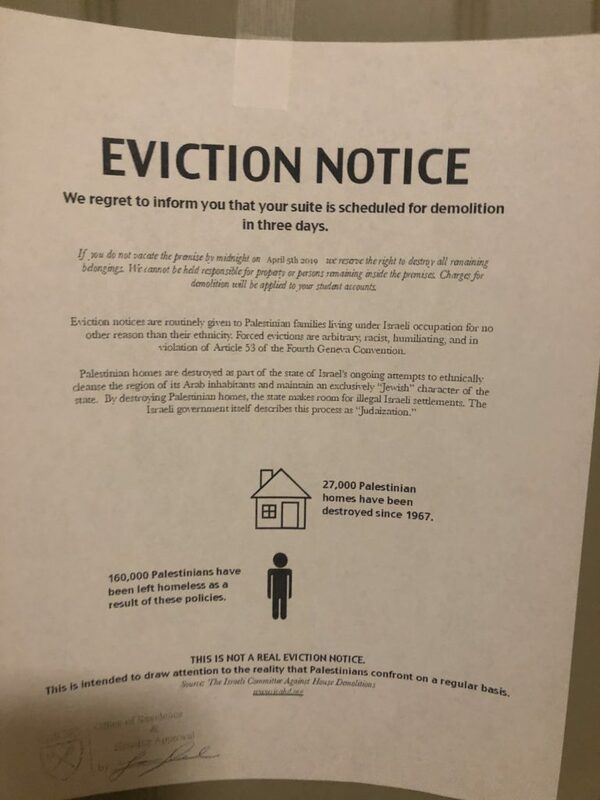 The mock eviction notices were distributed by Emory Students for Justice in Palestine (ESJP) during its Israel Apartheid Week as a protest against Israeli settlements in the West Bank. Israel Apartheid Week at Emory coincides with Israel Week, sponsored by Emory Eagles for Israel. The Office of Residence Life and Housing Operations approved the fake eviction notices to be posted around Emory’s campus but staff removed the flyers from students’ doors because distributors violated Campus Life’s policy against posting flyers on doors. In an April 5 statement, ESJP wrote that alt-right blogs and anti-Muslim hate sites have “intimidated students with frivolous legal actions; engaged in aggressive cyber-bullying; [and] sent death threats and threats of violence” in response to their distribution of mock eviction notices. ESJP called on the University to “discipline students and other Emory community members that are complicit in the ongoing harassment” and discouraged the endorsement of Emory’s Jewish student organizations during this time. Emory Police Department (EPD) Records Manager Ed Shoemaker said the department received multiple complaints about the flyers. EPD is gathering facts about the case, according to Sgt. Ryan Andrews. He did not clarify by publication time whether there is an active criminal investigation. “Our students were very disturbed by this evasion of their personal space, of their personal safety in their own residence on campus,” Director of Emory Hillel Dave Cohn said. Zalman Lipskier, executive director of Chabad at Emory, informed Chabad members via email that a “high profile” lawyer is willing to represent students if they feel threatened. Juliana Nikodym (17Ox,19C), who attended an ESJP-hosted lecture on Wednesday, said she was impressed by the mock eviction notices. As part of Israel Apartheid Week, ESJP held a “die-in” on Cox Bridge on Wednesday. The silent protest occurred during Wonderful Wednesday, where Eagles for Israel was also tabling. 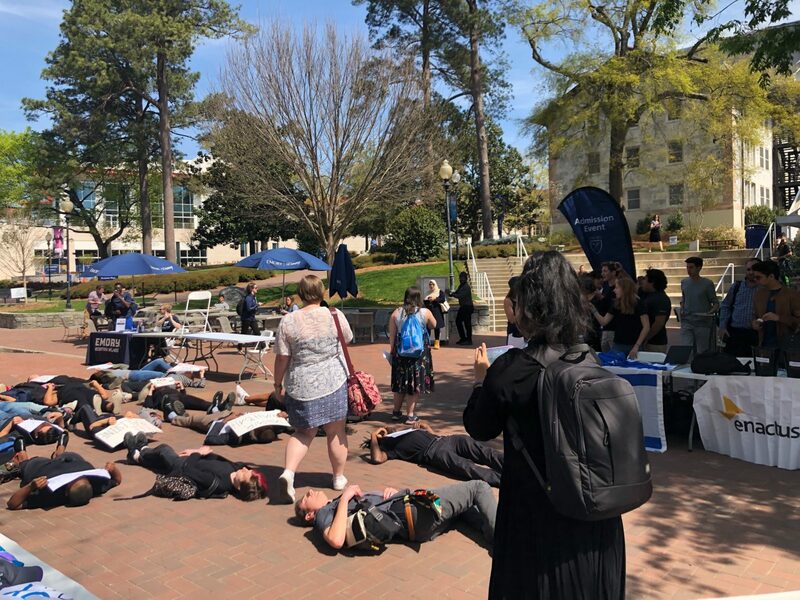 “The die-in happened right in front of us and they came to interrogate our table with all of these pictures and give us these terrible looks,” said Sophia Weinstein (19C), co-president of Emory-Israel Public Affairs Committee. She added that ESJP also protested next to Eagles for Israel when they held an event earlier in the week. Vice President of Eagles for Israel Melissa Harari (19B) said she was invited by an ESJP member to attend a lecture hosted by pro-Palestine group on Tuesday but was shunned when she invited their members to discuss the Israeli-Palestinian conflict with her. Harari said she has no issue with the violations to campus flyer posting guidelines but said Emory should reform its free speech policies to prevent hurtful attitudes. In an email to students, Interim Vice President for Campus Life Paul Marthers said Campus Life is investigating the incident and has engaged with ESJP. Marthers directed students to campus resources, including Counseling and Psychological Services (CAPS). Cohn, director of Emory Hillel, said the University’s response is unsuccessful in quelling students’ fears. Update (4/8/19 at 7:02 p.m.): The article has been updated to include ESJP’s statement. Correction (4/5/19 at 8:29 p.m.): A previous version of this article stated that Sophia Weinstein is the vice president of relations for Eagles for Israel. In fact, she is the co-president of Emory-Israel Public Affairs Committee.